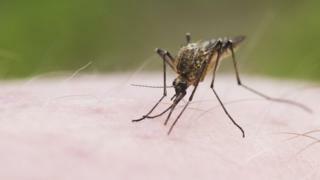 The unusually hot summer has ravaged the mosquito population in Finland, but it appears other blood-sucking pests are thriving, it's been reported. With meteorological records being broken across continental Europe, Finnish experts say that the country has experienced its hottest July on record, with one town experiencing heat of 33.7 Celsius (92.6 Fahrenheit). The heat means that mosquitoes, often the bane of Finnish summers, have virtually disappeared from some areas. According to the University of Lapland's Dr Jukka Salmela, the shallow ponds in areas like Lapland - which are their breeding grounds - have largely dried up, meaning that there are far fewer larvae than usual. Dr Salmela, whose field of expertise is biting midges in Lapland, warns that the new conditions have become perfect for horseflies. "It was almost laughable how many horseflies there were," he noted of his experiences in the northern Sodankylä region of Lapland earlier in the summer. The record-breaking summer has also brought bad news for Finland's dairy farmers. Lower yields of hay mean that they may not have enough animal feed for winter, resulting in animals inevitably being sent for slaughter, national broadcaster Yle reports.